One of the most common small breeds of dogs is the Dachshund and this dog has become really popular with pet owners. However, one of the things that pet owners often wonder about their Dachshund is what kind of food to feed it. In this guide, we will be looking at the Dachshund breed closely and covering all of the various aspects of food buying that pet owners need to understand. There are several things to keep in mind when it comes to Dachshund nutrition, and knowing what kind of calories your dog needs, what ingredients are best for him or her or how to avoid common food-related allergies are all crucial when it comes to choosing the right food. Now, let’s take a look at five of the top foods for Dachshunds so that you can see which of all of the available foods are best to feed your dog by example. You don’t have to choose one of these top five, but they certainly do fit the expert’s recommendation on what you should be feeding your Dachshund. 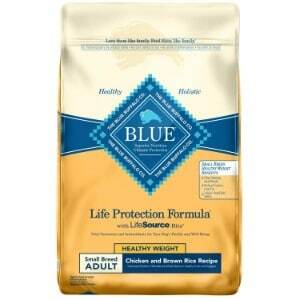 The first dog food that is recommended for Dachshunds is this life protection formula from Blue Buffalo. There are tons of different flavors that you can choose from when it comes to this dry dog food, and you are sure to find something that your Dachshund will absolutely love. Some of the flavors include things like chicken and brown rice, lamb and brown rice, chicken, fish and brown rice and more. These foods are also divided up into the perfect ones for small breeds, large breeds and medium-size dogs. In addition, you can choose the quantity of food that you get so that you can save a little money by buying in bulk. These foods are offered in four-pound, six-pound, 15-pound and 30-pound varieties. These Blue Buffalo foods always feature real meat as the first ingredient. When you feed your dog, you definitely want to look for foods that offer meat as the primary ingredient because as dogs have evolved, that’s exactly what they ate and that’s what their body is used to and specifically designed for. However, modern science has also identified certain ingredients that dogs need like a particular blend of proteins and carbohydrates to meet dogs energy levels. Since these are formulated for specific breeds and sizes of dogs, you don’t have to worry about feeding your dog too many calories and them becoming overweight. 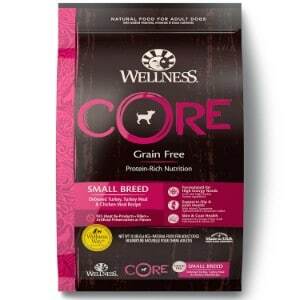 This Wellness Core natural grain-free dry dog food is perfect for Dachshunds because there are so many different varieties and sizes to choose from, and they are specifically designed to fit a particular breed or size of dog. Some of the flavors you will find with this Wellness Core food include turkey and chicken, ocean whitefish, herring and salmon, wild game duck, turkey, boar and rabbit among others. There are also various sizes offered from a very small four-pound bag to a large 26-pound bag that is going to keep your dog fed for many weeks to come. When it comes to Dachshunds, this is one of the best foods out there because it is 100 percent grain free and balanced nutrition for your Dachshund. This is a specifically designed food for small breeds of dogs like Dachshunds, made to be rich in protein with meat as the primary ingredient, and tailored to the optimal calorie levels to support the energy needs of smaller breeds of dogs. In addition, this food is all-natural and only contains ingredients that you would find in nature without any byproducts, wheat, corn, artificial flavors or preservatives. This is simply one of the best foods that you can give your Dachshund. 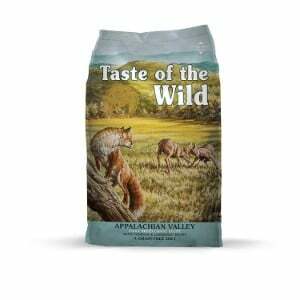 This grain-free high-protein food from Taste of the Wild is one of the best foods for Dachshunds for lots of reasons, and it is one of the best natural foods out there for any breed. First, let’s take a look at some of the flavors that this dog food offers. Your Dachshund will love the venison and bison flavors of this dog food, particularly because you don’t find these flavors very often with dog food. Some of the other flavors include Pacific stream salmon, Sierra mountain lamb, wild boar, roasted duck and several others. The sizes that this food is available in include a five-pound bag, 14-pound bag, 15-pound bag, 28-pound bag and 30-pound bag. But the flavors and the sizes are definitely not the most impressive part of this food. This food is perfect for Dachshunds because it includes real meat as the number one ingredient. That means that you get the optimal amino acid profile that your dog needs and that their body has been genetically designed for. In addition, vitamins and minerals have been added as fruits and vegetables in order to give your dog the same robust diet that they would get out in the wild. These ingredients come from trusted and sustainable sources without any preservatives or other unnatural ingredients. The reason that this Wellness Complete Health food is great for Dachshunds is that it is specially formulated for small breeds of dogs. Unfortunately, this does not come in multiple flavors like some of the other foods that we have discussed here, but it does come in two different sizes including a 4-pound bag and a 12-pound bag. In addition, the ingredients making up the small breed formula is perfect for Dachshunds featuring a smaller kibble size that they can easily chew and consisting of flavors from turkey, oatmeal and salmon. Your dog will love this food and they will be able to easily eat it even with smaller mouths. 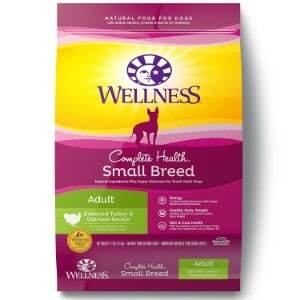 This is complete health and nutrition for your Dachshund. This is been designed for a balanced diet that will make your small dog have the energy they need to get through the day and it is made up of all natural ingredients that contain no wheat or corn products as well as no soy, no artificial flavors, no colors and no preservatives. The meat is actual meat and it features that as the primary ingredient with no meat byproducts whatsoever. In addition, this food is made in the USA and backed by the Wellness Complete company guarantee. 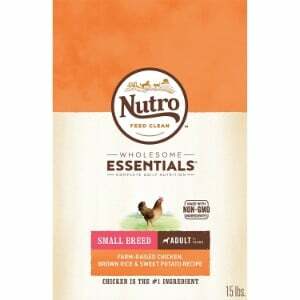 Another terrific dog food comes from Nutro and it is this wholesome essentials package that gives your Dachshund the complete health that they need to perform their best. This comes in two different types of formula for small dogs and toy dogs. It also comes in a couple different sizes including a five-pound bag and a 15-pound bag. However, the best thing about this food is that it makes farm-raised chicken the number one ingredient. Your dog will love the flavor of this food which combines the primary ingredient of chicken with brown rice and sweet potatoes. In addition, this dry dog food contains omega-3 and omega-6 fatty acids to promote good health for your dog including a soft and shiny coat. This food is also made with non-GMO ingredients and it tastes excellent. This will soon become a favorite for your Dachshund, and you will love feeding it to your dog because you know that it is completely natural and totally healthy for them. This food offers tailored nutrition for breeds like Dachshunds. There are lots of things to bear in mind when it comes to buying the right dog food for Dachshunds. You have to understand what sort of foods are appropriate for that breed, what health problems are present with Dachshunds, what sort of allergies that they can have and which ingredients can trigger them; and the type of food that they prefer in the first place. These are all factors that go into buying the right dog food. In this buying guide, we will cover a great deal of information about the Dachshund breed so that you can know everything there is to know about buying the right food to keep your dog is healthy as possible. First, you should understand a little bit about the Dachshund breed. It doesn’t matter what kind of accessory you are getting for your dog. You may be getting them an outdoor dog kennel or dog playpen for exercise, or you might be looking at a dog house, dog crate or dog bed. In whichever case, you need to be aware of the nuances of that particular breed as you are shopping and that includes buying their dog food. Let’s take a closer look at Dachshunds so that you can decide on the dry dog food, wet dog food or puppy milk replacer for your Dachshund. Dachshunds are a popular breed today, and these dogs can be clever and playful with a reputation for fearlessness as well. This small breed originated in Germany to chase after badgers on a hunt. Dachshunds can be either long-haired or wire haired and their medium-size dogs as well as toy versions of the same breed. Dachshunds were recently rated as the 11th most popular dog breed in America, and they are owned by many happy dog owners throughout the country and around the world. They are an excellent dog for someone who has a very small space such as in an apartment that allows pets. Getting to know your dog is important, but understanding what nutrition is best can be challenging. To understand what is the best food for Dachshunds, you have to know what sort of nutritional profile fits the dog best. Obviously, you want to go with food for small dogs instead of food for large dogs, but depending upon the age of your dog, you may need senior dog food or a particular type of dog food if your Dachshund has health problems like dog food for sensitive stomachs or low-protein dog food. No matter what kind of dog you have, you should always strive for grain free dog food and organic dog food if possible. Dachshunds usually weigh between 16 and 32 pounds at the standard size while miniature Dachshunds weigh 11 pounds and under. All of these are the same breed with the same basic dietary requirements no matter what size they are or what type of coat they have. There are a couple of health problems to be concerned with, but for the most part, Dachshunds are extremely healthy and live for a long time. However, the caveat is that you need to have the proper nutrition, get plenty of exercise and have regular veterinary visits as well. According to experts like those at the National Research Council of the National Academies, adult Dachshunds should be consuming around 925 calories per day. This is for a standard adult Dachshund of the ways around 30 pounds. If you reduce this to smaller sizes then they have new calorie needs. For example, Dachshunds that weight only 10 pounds would only need around 400 calories a day. Dogs may need fewer calories as they get older and less active. Dachshunds do require high quality protein with a minimum of 22 percent of their food made up of protein when they are young and 18 percent as adults. They should also get between five and eight percent of their diet from fat depending upon whether they is a puppy or adult, because fat is one of the best sources of Omega-6 and omega-3 fatty acids which is important for many different parts of your dog’s development. Many dog breeds have health problems, and finding the best food for your Dachshund requires that you know what these common health problems are and how to plan for them when you buy dog food. One problem that Dachshunds can have is a deep chest problem. This makes it very easy for them to bloat which is extremely uncomfortable. Because of this, veterinarians and dog health experts recommend that you feed your Dachshund several times a day instead of just twice. For example, breaking those two meals up into four smaller ones is much more preferable. You also want to find foods that are easy to digest for Dachshund is because some of them have sensitive stomachs. The best way that you can combat this problem is by choosing foods that have high-quality ingredients. Another thing to keep in mind with this breed is that they are low-slung. This means that they can sometimes experience back problems such as intervertebral disc disease. This is especially true if your Dachshund is obese. They can become injured from being overweight, or by getting too excited and jumping too much or over-exercising. In fact, this is such a common problem that whenever you go into the vet your Doctor will probably look for it. That’s because it affects around 25 percent of Dachshunds. The best way that you can combat this is by feeding them the right dog food. You also want to be concerned about luxation. Luxation occurs with this breed as it does with many smaller breeds. Luxation is similar to displaced kneecaps on a human. It is a painful condition where the joint of the leg locks and the dog has to hop in order to move. In some cases, the only way to correct this is through surgery, but again, if you feed your dog the correct amount of food with the right ingredients, you may be able to prevent this altogether. One other thing to keep in mind is that some Dachshunds have thyroid issues that you should be aware of. In some cases, this can lead to weight gain and that will exacerbate all of the other problems that we discussed above. If you notice your dog is gaining weight quickly, and you are feeding them the correct amount of calories, then it may be a thyroid issue. You should talk to your vet to make sure, particularly if you notice that your dog does not have the energy that they should. The best ingredients for Dachshunds that you should be looking for also depend upon several things. For example, getting the right dog food for allergies will be important to some pet owners. However, like all dogs, Dachshunds require a diet that is high in protein. Your dog should be getting nearly 20 percent of the diet that they consume from protein. They should also be getting between five and seven percent from fat. Both of these will be a little higher if they are puppies. The most important thing that you can do when it comes to choosing the right dog food for your Dachshund is to make sure that they are getting a food where the number one ingredient is real meat. You also want to make sure that your dog is getting other nutrients as well. Some dog foods add vegetables and fruit in addition to the meat in order to provide them with much-needed antioxidants and other nutrients. However, sometimes it is not enough and you have to make sure that whatever dog food you select is also adding and supplements that may not be present in the ingredients that you have. The main thing that you want to keep in mind when it comes to choosing dog food is a you don’t want one that is heavy in carbohydrates or has grain, wheat or other fillers. You also want to avoid preservatives and artificial flavors and coloring if you can as well. If you have Dachshund puppies, then you might want to consider a slightly altered approach to nutrition. For one thing, your Dachshund puppies will need more protein and more fat than adult dog gets. While an adult dog might be fine with 18 percent protein, it should be closer to 25 percent for puppies. The same goes for fat. If your dog is getting five percent of fat as an adult from the dog food that they eat, then this should be raised to somewhere around eight percent if they are a puppy. There are usually foods that are specifically formulated for puppies if you look for them. If you have a dog that is in the first stage of development, then you definitely want to make sure that they are getting all of the nutrition that they need. Ensuring that your puppy gets all of the protein and fats that he or she needs at that stage of development will ensure that they are a healthy adult as well. That’s what you want to choose a puppy food that is specifically formulated for younger dogs. There are lots of them out there, and even most of the major brands will provide puppy food in the same flavors as adult food. The bottom line is that there are plenty of things to keep in mind when it comes to making sure that your dog has the right nutritional profile that he or she needs. You have to make sure that there is enough good protein and fat in your dog food to give them the tools that their body needs to become strong and healthy and reach their full potential. In addition, you need to be concerned about common health problems and make sure that your diet is tailored towards helping them alleviate or avoid those health problems. There are lots of things to consider when it comes to choosing the right dog food, but this buying guide should give you the tools that you need to always make the right choice and get your dog the right nutrition.